Dec. 2, 2017 8:10 p.m. In the end, the championship experience of the Semiahmoo Totems came through. 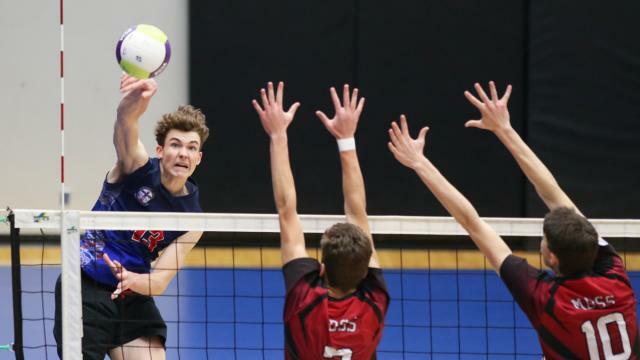 The Totems won the first two sets 25-21 and 25-22 of the gold-medal match of the BC high school volleyball AAA championships on Saturday night at the Langley Events Centre. So when the Mount Baker Wild — the tournament’s top seed — came roaring back with 25-18 and 25-12 victories to force a fifth and deciding game, the Totems were able to draw on last year’s experience, when they captured the provincial banner. “You know sometimes you see the light at the end of the tunnel and think it’s the sun? Well it was a train,” said Semiahmoo coach Michael Sapic. The coach said he didn’t even let his players to the bench after the one-sided fourth set. All he told them was that the first four sets didn’t matter and that at the start of the season, they would have gladly accepted the chance to play in the fifth set of the gold-medal game. The teams were tied at six in that decisive set, but the Totems scored nine of the final 15 points to win 15-12. “I just told myself and my team to stay calm,” said Semiahmoo’s Mike Dowhaniuk, who earned his second consecutive most outstanding player award. The Totems were seeded ninth for provincials after placing third at the Fraser Valley championships and Dowhaniuk said their semifinal loss at that tournament was a good wake-up call for the team. Semiahmoo was second in their pool after going 2-1 on the first day of provincials. They then beat Kelowna 3-0 in the round of 16, won 3-1 over Penticton in the quarter-finals and 3-0 over Earl Marriott in the semifinals. Mount Baker went 3-0 on the first day before winning 3-1 over Reynolds, 3-0 over Elgin Park and 3-0 over Seaquam on their way to the championship final. “Coming out, the boys were playing a little scared,” admitted Wild coach Karley Ferner. “The first two sets, giving them those two, obviously didn’t help, but they weren’t playing with confidence — they were playing a little bit scared, they were swinging a little scared. The Wild’s second-place finish matched their result from 2001, a best-ever for the program. “We knew we had the talent. It’s a good finish — it’s bittersweet, we are really happy to get number two but of course, you want the win. But they put the work in and accomplished what they wanted to do,” Ferner said. Mount Baker’s Quinn Grist and Caleb Peters were named first team all-stars while Semiahmoo’s Tyler Buchanan and Adam Paige were also named to the team.